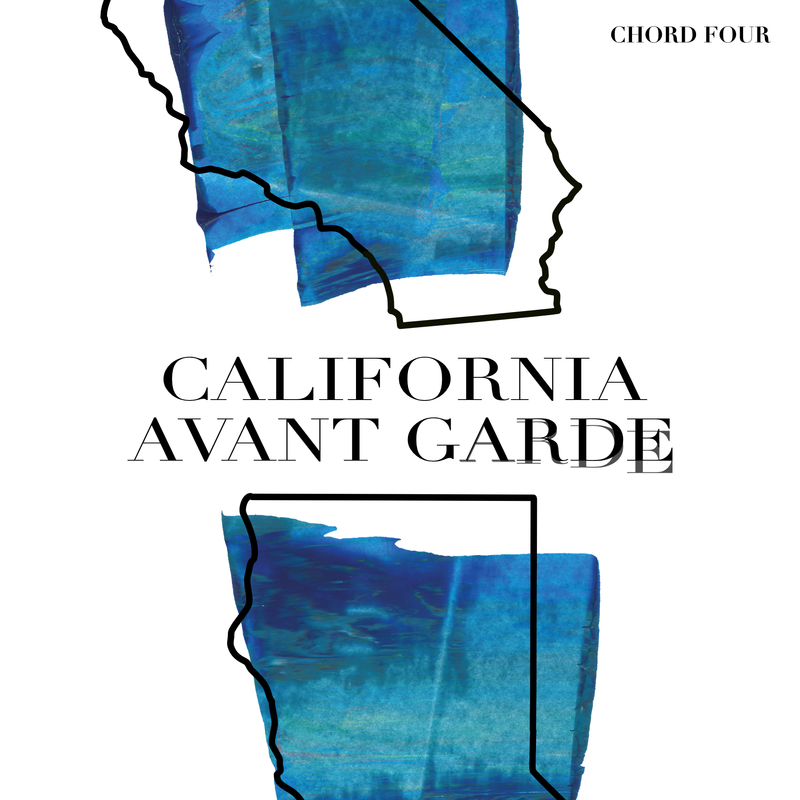 Inventive quartet Chord Four offers a West Coast take on modern jazz with California Avant Garde, due out May 3, 2019. The exploratory foursome celebrates a decade together with their second full-length release, capturing their global influences and wide-ranging improvisations. 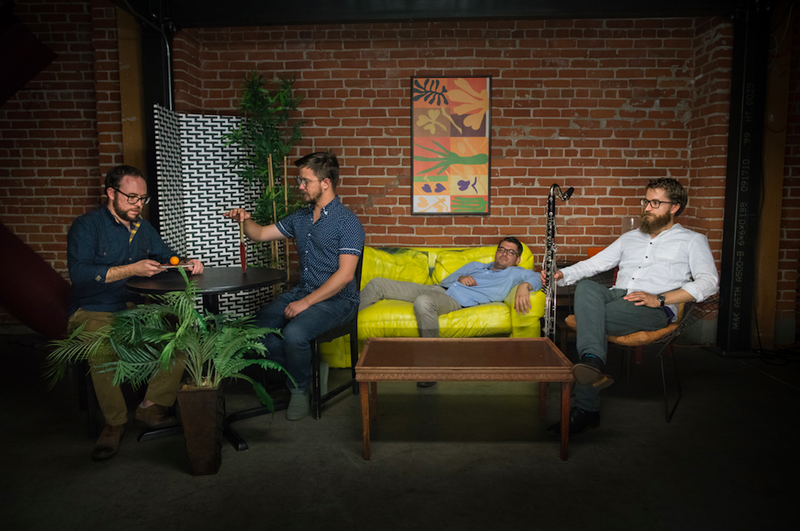 On their long-awaited second album, California Avant Garde, Chord Four makes the case for a West Coast perspective on the forward-looking music. In keeping with their home state’s sunnier disposition (not to mention their own love of clever wordplay, as evidenced in their song titles), Chord Four approaches the idea with tongues at least partly in cheek, though with a spirited interplay deepened by a decade of exploration together. 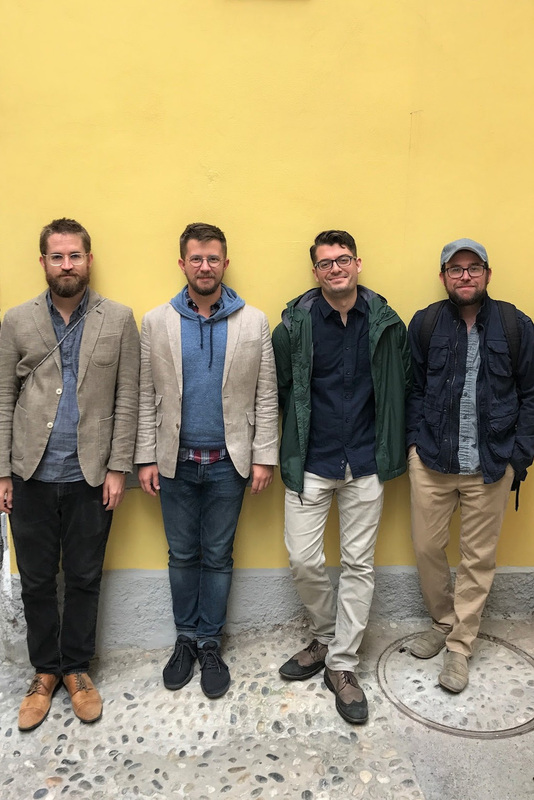 The quartet – saxophonist Andrew Conrad, trumpeter Brandon Sherman, bassist Emilio Terranova, and drummer Colin Woodford – were all students together at California Institute of the Arts, where they discovered a shared array of disparate influences and a common musical purpose. “The first time we played together, we realized how connected we all were musically and improvisationally,” Conrad recalls. “It was apparent that this was a fun combination and a really freeing group. We all feel like we can do whatever we want to do and act on what we each hear.” California Avant Garde, due out May 3, arrives more than eight years after the band’s self-titled debut; they’ve kept busy in the interim with a number of digital EPs and video releases while, most importantly, continuing to hone their wide-ranging and spontaneous sound live. In the summer of 2017 those efforts were awarded with first place honors in Italy’s Conad Jazz Contest, leading to a performance at the prestigious Umbria Jazz Festival. Downbeat hailed the band’s performance, praising original compositions that “coalesced a global array of rhythms and out-of-the-box structures to facilitate fresh thinking on the improvisations, which, indeed, were consistently focused and creative." “It’s very different being taught a style of music by people from within that tradition,”Conrad says. A lot of the learning happens in a very different way than we’re used to in the western academic style. West African drumming, for instance, is heavily based on listening and reframing how you think music works, and that influenced us all to heavily rethink and reevaluate how we approach composition." The very structure of California Avant Garde celebrates the band as a conglomerate of individuals. Over the course of the hour-long program, each member gets his turn in the spotlight with a brief solo improvisation (named for their instrument); at the end, all four join together for a brief improvisatory excursion, clocking in at under a minute but reveling in the sound of their collective voices. "The preceding band was Chord Four, comprised of West Coast-based 30-somethings Andrew Conrad on tenor saxophone, Brandon Sherman on trumpet, Emilio Terranova on bass and Colin Woodford on drums, who have been together since 2008, and sounded like it. Their seven original compositions coalesced a global array of rhythms and out-of-the-box structures to facilitate fresh thinking on the improvisations, which, indeed, were consistently focused and creative. Although Chord Four’s has been described as “avant-garde,” only the kaleidoscopic third piece (no title was announced) stood outside the 21st-century mainstream. After a brisk, odd-metered unison opening, Woodford blew a drone through a tubal instrument. The flow switched to a free-boppish sax-trumpet call-and-response space. Sherman—who displayed enviable control throughout the proceedings—soloed first, floating through the melody over a double-time bass vamp; after another statement of the form, he uncorked a brisk solo that evoked the raw lucidity of L.A. trumpet legend Bobby Bradford. Terranova played a virtuosic bass solo more reminiscent of Roberto Miranda than Charlie Haden. Conrad’s light-toned tenor solo, as throughout, was notable for motific phrasing and deliberate development."